This article is part of our special report The nitty-gritty of recycling. Market pull: sectors and brands are committing to achieving 90% collection rates for single-use plastic beverage containers and setting targets on recycled content, which means that food & drink operators must be actively considering DRS as one of their preferred collection methods. 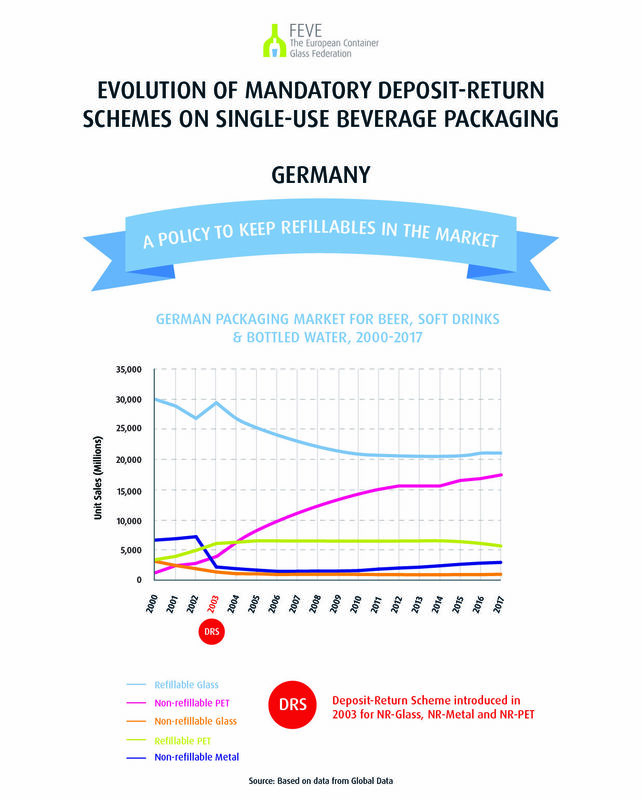 When the German DRS was introduced in 2003 on all single-use packaging types, refillable glass packaging had the largest market share on soft drinks, water and beer. By setting a higher fee on the mandatory deposit on single-use packaging over the voluntary deposit on refillable bottles, the policy was aiming at encouraging the use of refillables. 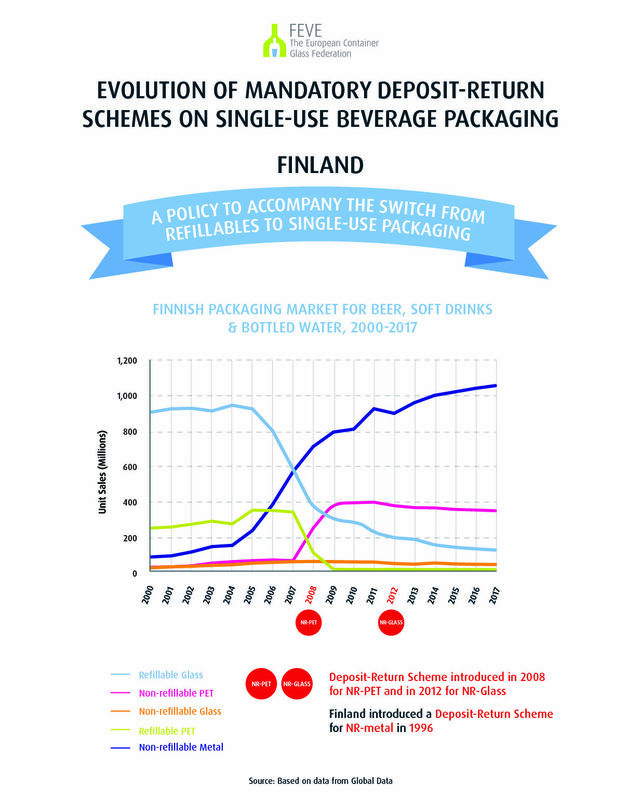 In Finland, mandatory DRS were introduced in a staggered approach starting with cans in 1996, extending to PET in 2008 and later to glass in 2012. This went hand in hand with policy decisions to cut down on refillable packaging, with a corresponding dramatic decline in refillables between 2004 and 2008 and an increase in single-use cans and PET. Contrary to Germany, the mandatory DRS was introduced to enable the switch from refillable glass to single-use formats, without losing the take-back culture acquired through refillables. The Lithuanian model is the most recent and the most representative of today’s debate on DRS. Although it covers all single-use packaging types, it was largely set up to boost collection rates for single-use PET. This is the type of objective expected of DRS now, especially with regard the Single-Use Plastics Directive. 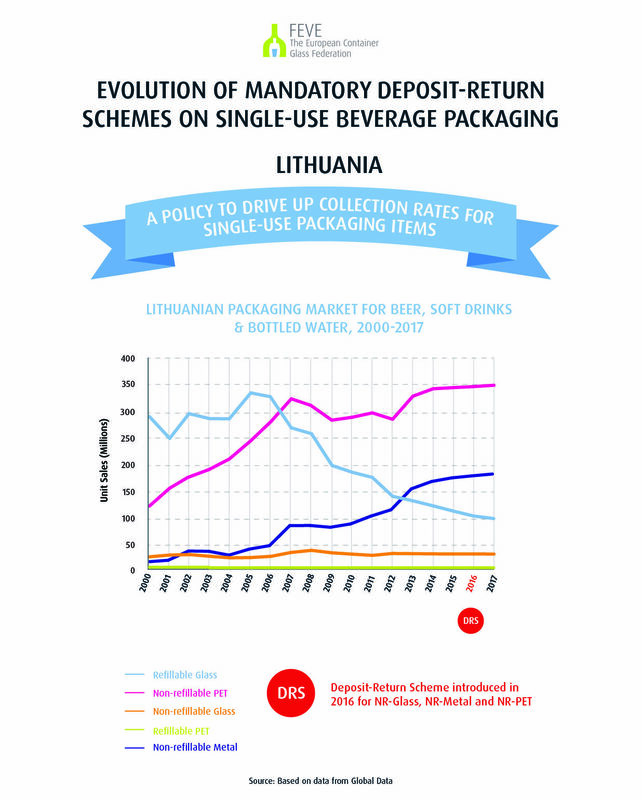 All the Member States operating a DRS on single-use beverage packaging have one thing in common: they have all previously operated a voluntary deposit-return scheme on refillable packaging. This would indicate that consumer “bring-back” culture does not happen overnight, and years of tradition with a refillable packaging material such as glass are needed to create the mindset for the return of single-use materials. The study also dispels the myth that a DRS on single-use beverage packaging favours the use of refillable packaging materials. The evidence shows the exact opposite trend: where a DRS on single-use packaging has been introduced, there are no examples of refillable packaging market share increasing. Even more dramatic, in the Nordic countries, the mandatory DRS on single-use packaging effectively replaced the system for refillable packaging. Non-refillable glass in a DRS: what impact? There are already many different voluntary DRS operating for refillable glass packaging. Non-refillable glass is endlessly recycled thanks to the collection for recycling systems managed by Extended Producer responsibility (EPR) schemes. Therefore, including one-way glass in a mandatory DRS on single-use packaging only diverts materials from established collection and recycling systems and creates confusion among consumers. Yet out of the 8 EU Member States operating a mandatory DRS on single-use beverage packaging (Germany, Finland, Sweden, Denmark, Lithuania, Croatia, the Netherlands and Estonia), only the Netherlands and Sweden have chosen to exclude glass from the scheme. 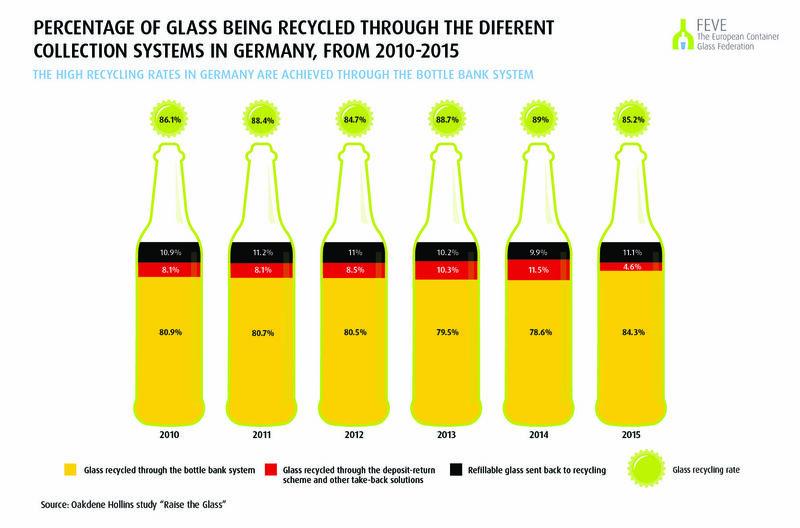 The best performing glass DRS country is Germany, but more than 80% of the total glass recycled is collected through the established bottle bank system and not the DRS, making the EPR system far more effective. 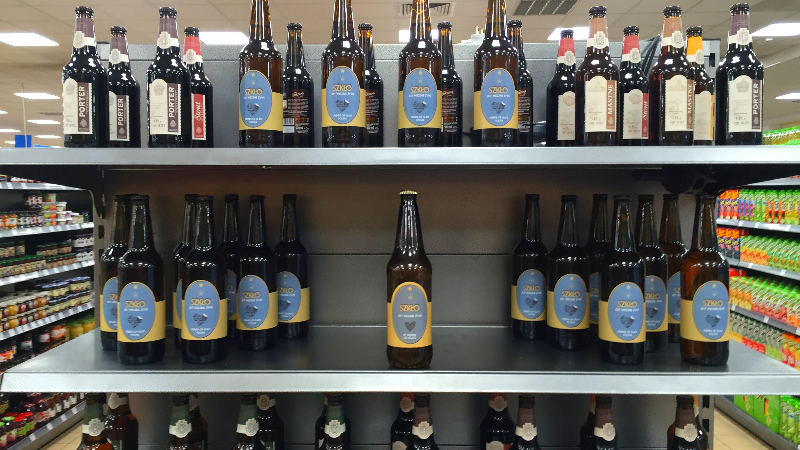 Closing the gap on collection and recycling: what solutions for glass? 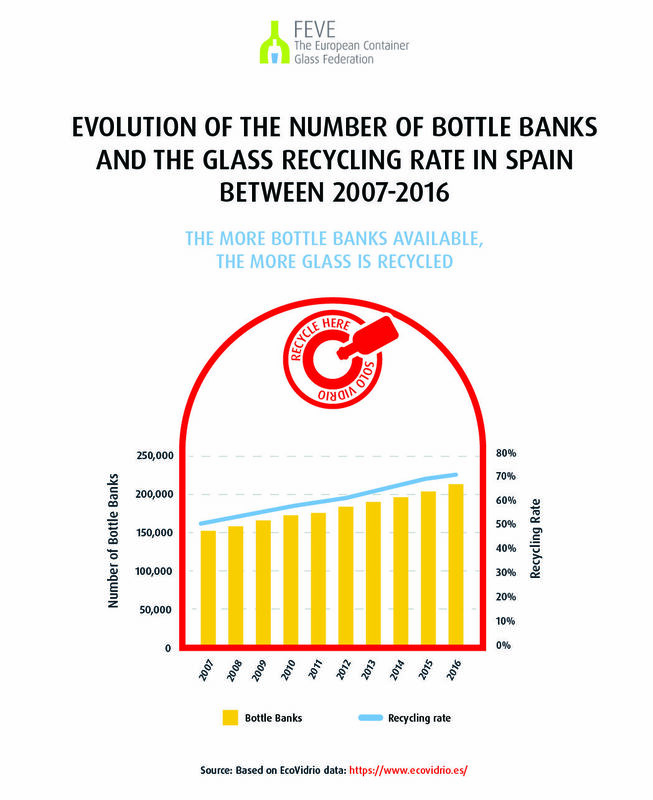 In Spain, which had a lower starting point than Sweden or Austria, there has been a gradual investment in bottle bank infrastructure and the more bottle banks are available, the more glass is recycled. 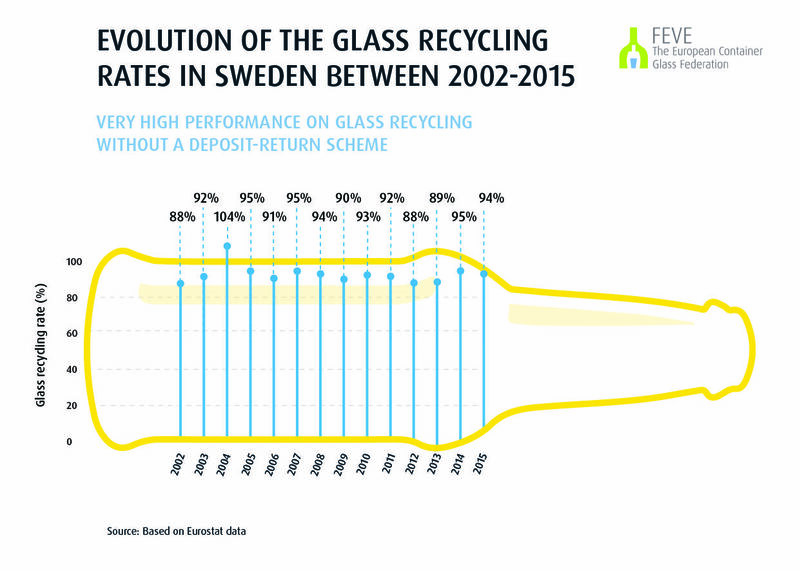 When designing EPR schemes for glass collection and recycling, Member States and stakeholders must ensure they are addressing the gaps and continue to invest in best practice schemes such as bottle banks, which have a proven track record. 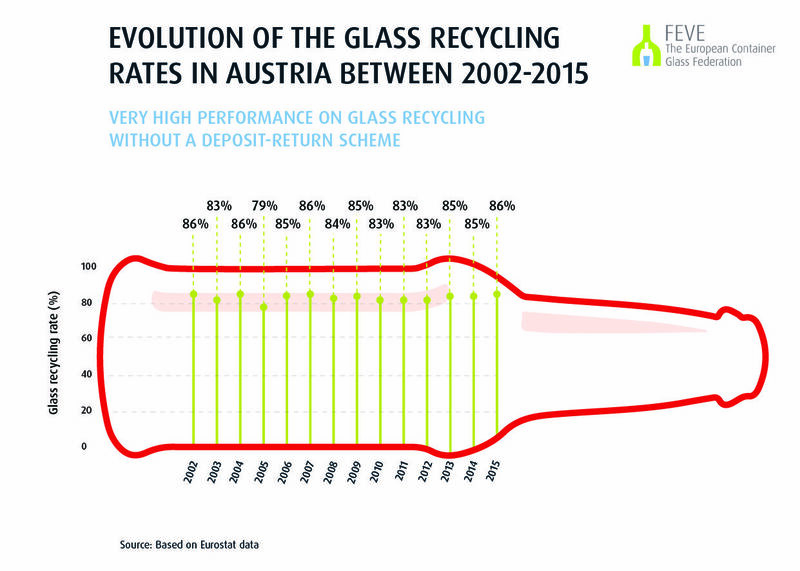 Inspired by the examples of Sweden, Austria and Spain that have been outlined in the study, the glass packaging sector will take an active role in defending Extended Producer Responsibility schemes and municipal waste management systems that make collection simple for the consumer and optimal for the recycling value chain. 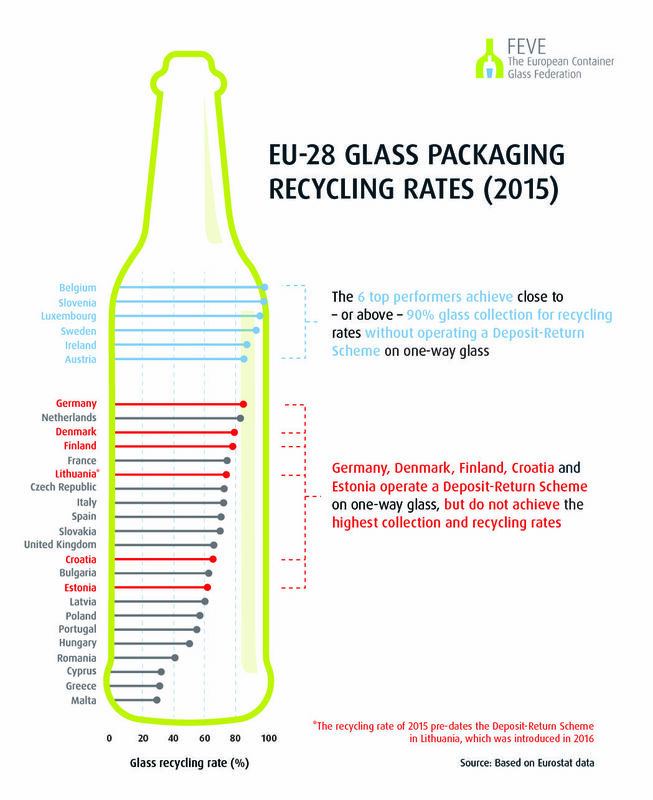 Separate collection and effective recycling of glass is part of our cultural heritage in Europe. We should uphold it for the future.